To troubleshooting Lexmark e260dn printer, verify that the electrical cable is plugged into the printer. Make sure it has a proper electrical outlet. Check if the electrical outlet is turned off by a breaker or switch. Ensure the printer is not plugged into an uninterrupted power supply, surge protector, or extension cord. Verify that the printer is turned on and check its power switch. Make sure the printer driver settings are correct. Ensure if the printer cable is attached securely to the printer and the print server, host computer, option, or another network device. Ensure that the paper is placed correctly in the tray to avoid a paper jam. Check if the correct printer software is installed. Ensure that your Lexmark printer is connected to the network and see if the network status shows Connected. Check if the printer cables are securely connected. Ensure that you are using a recommended Parallel, Ethernet, or USB cable. Check if the printer has enough memory space. Ensure there is not too much paper in the tray, and check if the stack of paper you load does not exceed the maximum stack height shown in the tray. Check that the ink or toner is evenly distributed in the cartridge. Step 1: You can also reset the printer by switching off the printer. Wait for 10 seconds and switch on the printer. Step 2: Ensure you have installed the correct printer software for the printer model by selecting Install Printer and Software on the Software and Documentation CD to verify which software is installed. Ensure that the model number of the software matches the model number of the printer. Also, verify that the printer software installed is the most current one. Step 3: Open the Print Properties in the Windows Operating System or the print dialog box in the Macintosh Operating System. Ensure that the Page Layout setting for Collate Copies is On or the Collate checkbox is selected. Step 4: Verify that the paper is loaded properly by pulling out the tray completely and check for misfeeds or paper jams. Ensure that the guides are aligned at the edges of the paper and insert the tray back. Step 5: Check the paper type. Check if the Paper Type setting matches the one which is placed in the feeder or tray. Step 6: Take the toner cartridge and shake it from one side to the other side well to distribute the toner evenly. Reinstall the cartridge. Step 7: Check the print quality issues by printing the print quality test page and following troubleshooting Lexmark e260dn printer procedure. First, switch off the printer and open the front door. Tap and hold the On button while turning the printer on and release it. Close the front door and the light sequence that represents the Home menu appears. Touch and release the X button until you see the light sequence for print quality test pages. Tap and hold the On button until all the lights cycle. After some time, the print quality test page prints. Step 8: You can print a network setup page and check if the status displays Connected. If the printer status shows Not Connected, check the network cables and then print the network setup page again. Step 9: If the tray linking does not work, place both Tray 1 and Tray 2 with the same paper type and size. In the print dialog or Print Properties window, change the paper source to automatically select. Step 10: Ensure that the paper path is clear as the paper can be stuck between the fuser and the photoconductor kit. 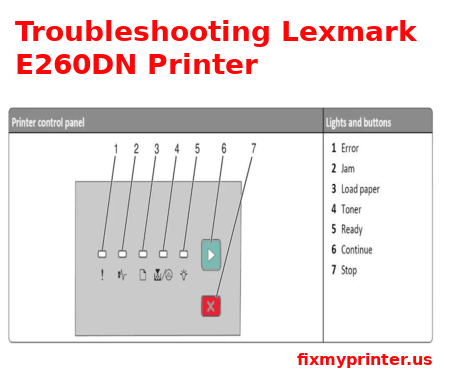 Check for the paper path around the fuser part and check whether you follow all instruction in troubleshooting Lexmark e260dn printer correctly.